Recently, Kaiser Permanente (KP), one of the largest healthcare organization, made an announcement that affects its 9 million patients. The organization has released an app for the Android platform which allows patients to access their medical information from virtually anywhere. 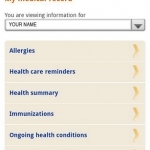 The app provides full access to patient information that currently resides on the KP health record system. Additionally, KP now has a mobile optimized website which allows members to also access their information via any mobile device platform. This website is accessible via a smartphone’s mobile browser and includes users of Windows Mobile phones, Blackberry and even the iPhone.